UK CPI inflation ended 2011 at 4.2% (December) coming down sharply from a peak of 5.2% (September) that despite the mainstream presses continuing academic backed falling inflation / deflation risk warnings remains at more than DOUBLE the Bank of England's 2% target that continues to make a mockery of the central bank whose primary remit is supposedly price stability. CPI 3% was supposed to have been the maximum level a break above which was supposed to trigger a series of panic measures to bring inflation under control, instead of which the Bank of England has instead opted to print money that to date officially totals £275 billion of electronic money printing that the fractional reserve banking system will eventually leverage to over £1 trillion for the primary objective for the monetization of government debt as warned of now 2 years ago in the Inflation Mega-Trend Ebook (Free Download). UK debt continues to be monetized at the approx rate of 15% per annum, with only the deflation fools and vested interest academic economists unable to realise the highly inflationary consequences of governments monetizing their own debt. For the risk is not just what we witnessed during 2011, but the risks are of loss of confidence in fiat currency amidst a panic that would fast accelerate towards hyperinflation. UK inflation ending the year at 4.2% is set against my January 2011 forecast (17 Jan 2011 - UK Inflation Forecast 2011, Imminent Spike to Above CPI 4%, RPI 6% ) that expected Inflation to remain above Bank of England's 3% upper limit for the whole of 2011 ending the year at 3.2%, which is set against the Bank of England's Feb 2011 Inflation Report that expected CPI of just 1.7% by the end of 2011. However, actual inflation as experienced by most people in Britain currently stands at a far higher rate of 6%, which explains why your weekly groceries bill is inflating at near twice the rate of official inflation indices that have been manipulated by successive governments to under-report the true rate of inflation. Whilst the inflation rate looks set to continue correcting lower into early 2012 as the UK economy starts to sputter in response to the Euro-zone in meltdown, with most of its member countries being consumed by debt deflationary black holes as they are unable to print money and devalue against Germany that further lacks any real means for internal transfer payments. However the UK still remains in an ongoing Inflationary Depression. 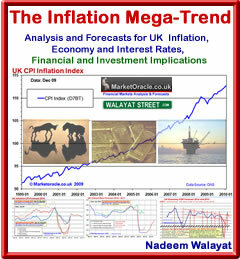 Contrary to the Bank of England's economic propaganda of high inflation always being just temporary (for over 2 years now), there is nothing surprising about persistently high inflation as I warned of 2 years ago in the Inflation Mega-trend ebook (FREE DOWNLOAD), high inflation is a deliberate and inevitable policy of the stealth default on UK public and private debt. The trend of high inflation is likely to persist for the whole decade because the government continues to accumulate new debt at the rate of at least £120 billion per year which remains on the SAME debt accumulation trajectory as the last Labour government despite the cuts and austerity propaganda. High UK Inflation that apparently surprised everyone to the upside for virtually the whole of 2010, by spiking and remaining above 3% from early 2010 illustrates the tendency of the mainstream press to basically regurgitate the views of vested interests that have beaten the drum of always imminent DEFLATION for the whole of 2010 and much of 2011 as high inflation was always just temporary and should be ignored by the general population, which is the precise message still being bleated out in the mainstream press today. To look at the reason why high inflation is being ignored we have to look beyond journalists, we have to look beyond academic economists that are paid to follow a school of thought that their pay masters want to push in the media. The place to look for the reason why high Inflation is being ignored is to the very top of the financial pyramid, the Bank of England. The following are the last 8 quarterly Inflation forecast reports by the Bank of England issued from February 2010 to November 2011 that were instrumental in academic economists and journalists in the mainstream press regurgitating the always temporarily high inflation mantra of the past 2 years, despite CPI spiking to 5.2% and still remaining at more than double the 2% Target. UK Inflation by Feb 2010 had as I anticipated spiked to above 3% (27 Dec 2009 - UK CPI Inflation Forecast 2010, Imminent and Sustained Spike Above 3%). However the Bank of England's Feb 2010 Inflation Report forecast the spike as being temporary and to imminently resolve in severe disinflation to target a rate of below CPI 1% by December 2010, instead actual UK Inflation for December was 3.7%. The forecast for by the end 2011 was for just 1.2%. The May 2010 Inflation report continued with the mantra of temporarily high inflation that would resolve in a rate of about 1.7% by the end of 2010, on the basis of spare capacity in the economy, the blatant flaw in the Bank of England's argument is the fact that much if not all of the spare capacity had been destroyed during the Great Recession of 2008-2009, since Britain did not have much of a manufacturing base to start with. The forecast for end 2011 was now revised to 1.3%. The mantra of spare capacity placing downward pressure on wages to resolve in disinflation continued in the August 2010 Inflation Report. However now with most of 2010 gone, The CPI target for 2010 was revised higher to 3% from 1% (Feb 2010), with CPI for 2011 forecast to resolve to 1.2%, and a sub 2% CPI in 2 years time. The Bank of England's November 2010 Inflation Report (November 2010) forecast UK CPI Inflation to target an early 2011 peak of 3.5% before inflation falls to approx 1.7% by end of 2011, and for inflation to remain well below 2% into the end of 2012, therefore supporting the Bank of England's persistent view that everyone should focus on the Deflation threat and ignore high inflation during early 2011 so as the Bank of England can continue to keep interest rates well below the real rate of inflation for the purpose of funneling savers wealth and tax payers cash onto the balance sheet of the bailed out bankrupt banks. The Feb inflation report (Feb 2011) revised the forecast for UK Inflation for end 2011 to approx 2.3% and yet again UK inflation in 2 years time would as if by margin fall to below 2% and therefore the real threat remained DEFLATION. The May inflation report (May 2011) revised UK Inflation for end 2011 to 4%, compare that against a range of between 1.2% and 1.7% pumped out as deflation mantra during the whole of 2010. The August 2011 Inflation amidst a panic of uncertainty at the Bank of England in recognition of not having a clue now forecast a spike in CPI to end 2011 at 5.2%, which is set against the Bank of England's propaganda that it would fall to below 2%. That 5.2% spike came in the following month (September 2011) which was set against the BoE forecast of barely 2 months earlier suggesting a 4.5% inflation rate for September. The most recent Inflation report of November 2011 forecasts Inflation to fall sharply over 2012, to end the year at approx 1.1% due to impacts from VAT, falling energy prices and labour market pressures, and at approx 1.3% by the end of 2013. A reminder of where the Bank of England forecast CPI Inflation would be by now a year ago 1.7%, and 2 years ago 1.2%. The primary mechanism for this stealth theft of wealth is by means of high real inflation induced loss of purchasing power of earnings that has been effectively masked from the public in the UK who are increasingly experiencing the real pain of not being able to maintain their standards of living without triggering angry public demonstrations compared to the near revolution that is taking place in Greece in the face of actual pay cuts, as Greece being part of the Euro-zone means it's government is unable to print money and use the inflation smoke and mirrors illusion to steal its populations wealth, but rather it is ultimately for German tax payers to finance the Greece state with loans that will never be repaid even in nominal terms let along real terms. Off course this is out of self interest to preserve and protect their own bankster's that rule Germany with nearly as iron a fist as their last dictator. 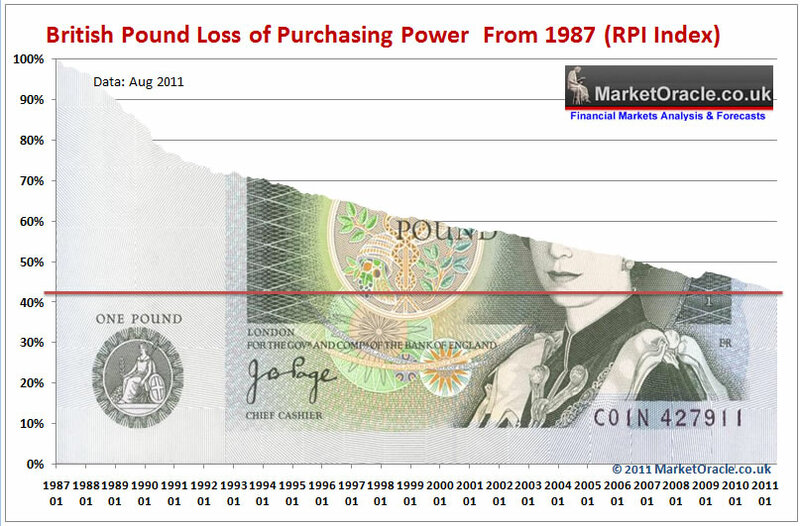 However theft of wealth by means of inflation is nothing new because governments printing money to buy votes is a perpetual policy of ALL democracies as the below graph illustrates the steady theft of purchasing power of sterling on the RPI inflation measure shows that over the past 24 years near 60% of the purchasing power of sterling has been stolen and funneled to those that control the printing of money, namely the banking elite. Savers experience the stealth theft of wealth where even the best savings accounts paying 3% are still resulting in a loss of life time accumulated wealth to tune of at least 3% per year (RPI and after basic income tax). For savers to just break even they would need to be in receipt of a savings rate of at least 6. My next serious of in-depth analysis will seek to formulate detailed Inflation trend expectations for at least 2012 and more likely into 2015. That seeks to answer key questions such as how can we have inflation if wages are falling in real terms ? To get this analysis and concluding detailed forecasts in your email in box, ensure you are subscribed to my always free newsletter.